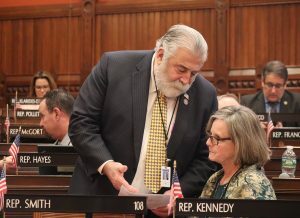 HARTFORD – State Representatives Charles Ferraro and Kathy Kennedy voted no on Wednesday on a union deal to increase the pay and to give out bonuses to unionized lawyers who work for the state Attorney General. The two-year pay deal for lawyers working for Attorney General’s Office will cost taxpayers $3.3 million each year. This includes stipends for department heads in the amount of $6,000 in the first year and $12,000 in the second year. 185 Assistant Attorneys General plus 14 department heads will benefit from this new union deal. The current average annual salary for these employees is $120,436. Over the next two years, the average annual salary will be increased to $133,436, due to this contract.